There are two e-books in this category which come as one complete download. The other is A Real Art Lesson. In terms of what you get for your money, the e-book course is a similar format to a printed book, although the quality of print depends somewhat on your printer. The advantage is that you can get a copy quickly, soon after paying online. This is a very popular way of purchasing books covering all sorts of subjects. However, the disadvantage is that anyone can publish their work on the internet, so it is easier to part with your money for something that has not been approved by a publisher, nor been published professionally. Reading reviews of e-books like this one at No1Reviews.com can help you get a good idea of the quality of the product before you decide to buy. 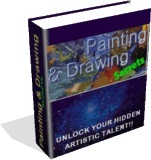 Painting and Drawing Secrets is a high-selling product - that is why it is here in the Top 10 Teach Yourself Painting category. On first impressions this is not a well designed website; the visual design is poor and like many sites designed to sell they have fallen into the trap of putting too much information on the page. This means that in order to get the information you need, you have to read a long "story" about how this is the best thing you have ever heard of in your life. Once sifting through this, the features of what you actually get for your money may be gleaned, and it does give quite a lot away on the website before you have paid a penny. The features listed above show quite a good broad range of topics to get you started in painting and drawing. Drawing techniques cover light and shade, media, perspective, the human figure, and most importantly but often left out, having fun. Paint media covered are the ever popular oil and watercolors. There are also chapters on sketching outdoors, a technical critique on building a picture, and in conclusion how to frame your work and suggested fields of further study. The style of the teaching here is not only to help you learn the techniques but also to develop your own style and enjoy your work. There is a section that encourages the study of art in galleries and museums. This is often missed out in how-to-guides, but can either be very inspiring or turn people off, depending on why they want to learn to paint in the first place. Some of these products have become popular because of a TV personality, which is great in encouraging people to get creative. The more serious artist will want to study the visual arts at a deeper level and what better way than to get out and about into the free museums and galleries in their nearest cities. The unique selling point of this product is that it teaches you tricks of the trade - tried and tested methods to produce the best results. By comparison, this e-book is a little more expensive than some of the other books in this category. There are three free bonus features (see above) and there is a 100% money back guarantee. If you decide you want your money back, you get to keep the bonus features. Overall the book covers a good range of learning topics and is fairly comprehensive in scope, so with the money back guarantee you have little to lose by purchasing this product.